I had a call from one of the agencies that I am registered with asking if I was available for two dates for some filming. 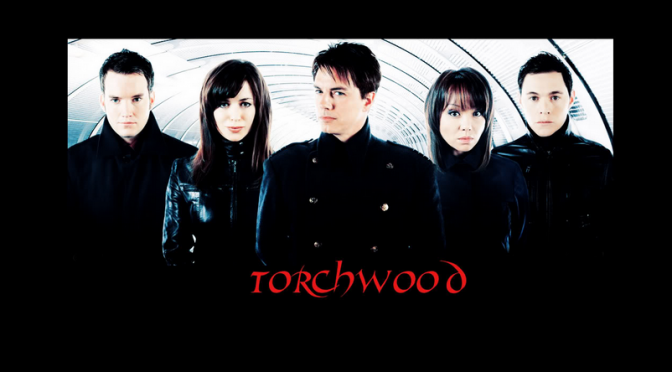 When I knew I was, I found myself booked to head down to the Torchwood set! 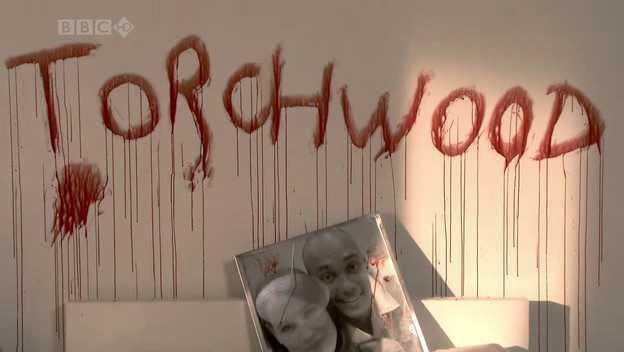 For those of you who are not sure what Torchwood is, it’s the new spin-off TV series of Dr Who. The new series is due to be aired from October 2006 consisting of 13 episodes on BBC3 with the possibility of it moving to BBC1. Bearing in mind that the series hasn’t started airing yet, and not wanting to get into trouble by saying something that would give something away plot wise, I will not state any names of characters. This is just my report of my experience being on set. I knew very little of what I was going to be doing apart from being asked if I didn’t mind having special effects make up applied to me! I said no of course! When I arrived on set I was met by several people who were really nice, I then started to learn what I was going to be doing. I would be playing a character that has been murdered and is the wife of one of the episodes characters (so in other words a dead person!). I find that my character has been murdered with a certain dagger by having her throat cut! My first day consisted of having several establishing photo’s taken of my character and her husband together. These will be seen around their house in frames and on the walls (see photo on bed). 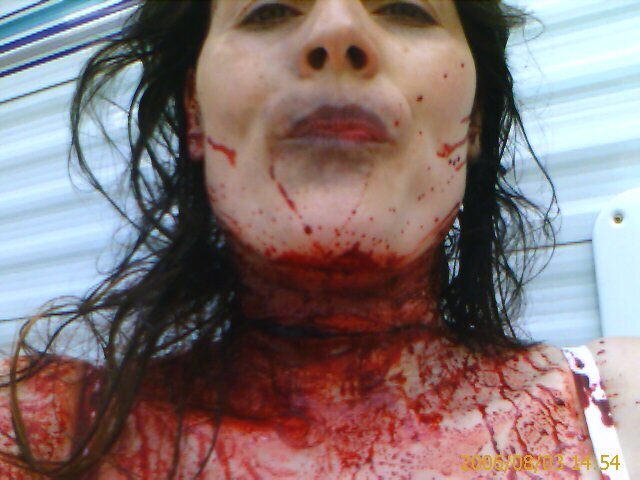 The next photo is of her mortuary shot, with her lying in a body bag looking very dead with a large cut to her throat! (photo in scene with Jack interrogating Suzie). It was really fun, I go into the make up trailer to be made up all nice and having my hair done nicely for the happy photo’s. 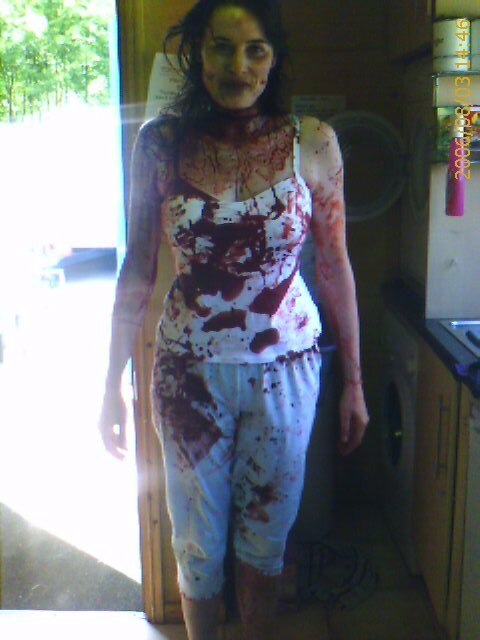 Then I go back to the trailer to change into a mortuary gown (thankfully not a backless one!) 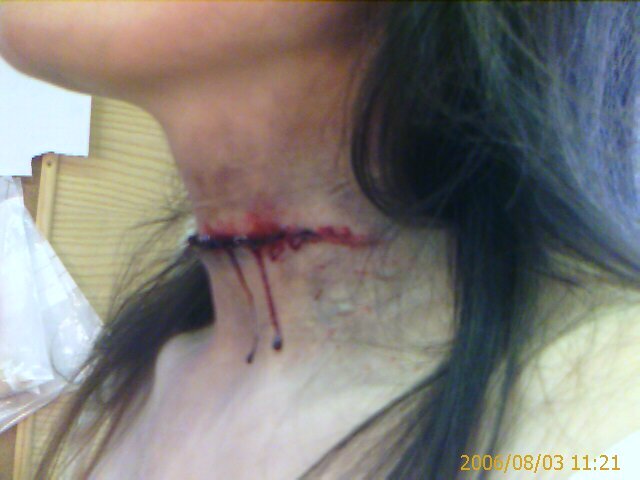 and then go to the make up trailer to have my throat cut! (Make-up wise!) This was really interesting to watch sitting in the make-up chair with my head tilted up and having a silicone mixture applied across my throat. Then when it had started to set, watching the incision being made across from one side to the other and then being made up was really freaky! The make-up took about an hour to do and gel was added to my hair to make it look stringy and limp. To add to all this, half way through the procedure the actress Eve Myles who plays Gwen Cooper sits down next to me in the make-up trailer! I then walk across the car park to the set in a mortuary gown with my Reeboks on looking really dead, it must have been a really funny site!! (I just kept thinking of Shaun of the Dead!) I then lie down on a body bag and have several photo’s taken and thats it! I head back to the make-up trailer to get cleaned up and change back into normal clothes. This was my first of 2 days on set! Next week is the big bloody death scene! 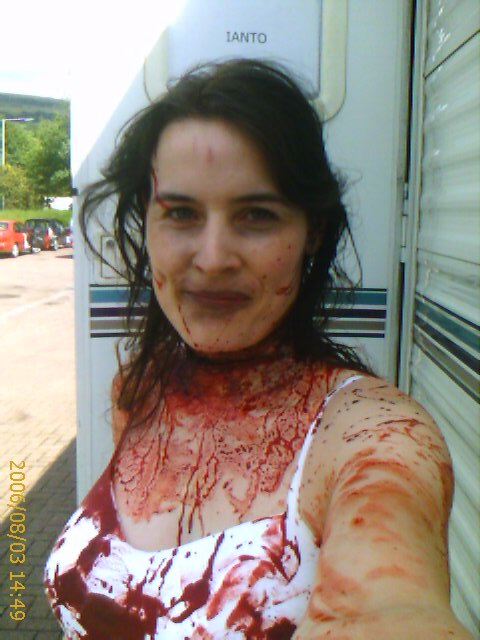 Second day on the set of Torchwood was a scorcher of a day, I arrived on location and tried to stay cool in the trailer. It looked like the scene I was in was going to be the last shoot of the day. Eventually I got the call to go to wardrobe to get my costume which was basically a set of PJ’s! 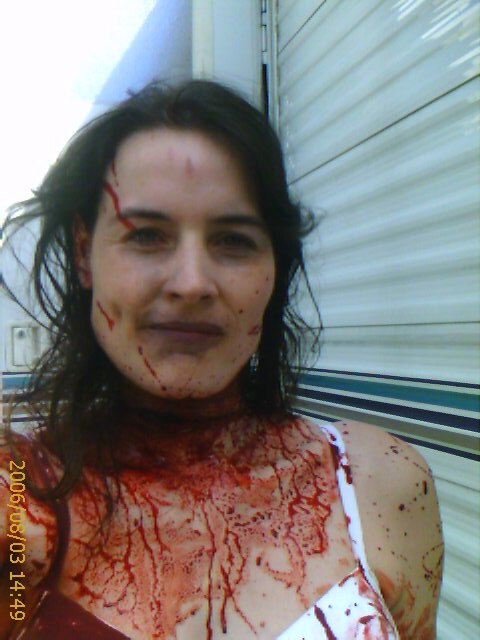 Then I head to the make-up trailer for the grizzly injury to be applied. The make-up lady had made a latex appliance a couple of days beforehand ready for today to apply to my throat. As this was going to be a fairly fresh wound it would be more visual than the one I had the week before. First she applied some tissue paper to my throat and stuck it on to give the inside of the wound some texture, then she glued the appliance on over the top. The edges were then worked on to blend them away, extra latex was added to make sure the appliance would stay in place as it was so hot. The biggest fear was it peeling off with the sweat! After working on this part for about half an hour, foundation then started to be applied with a very cool make-up air brush. The only trouble was, as it was so hot, the liquid foundation kept evaporating. Eventually when this had been sorted the rest of the colour was added, with a darker mottled effect and slight discolouration. With some red colouring and fake blood being applied in the open wound it was looking really nasty! 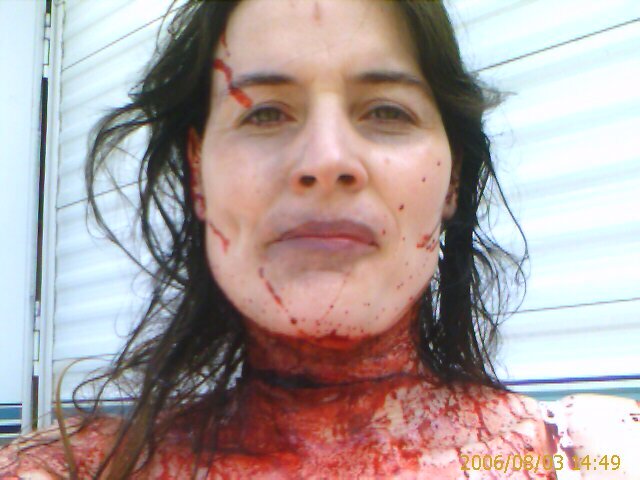 The rest of the blood would be applied once on set. Eventually after hogging one of the fans in the make-up trailer we got the call to be taken to the location. The scene would involve my characters husband too, so we were both taken to what was our home, a very nice house in the suburbs. The main characters were already in the room filming the scene without the murder victims in situ as we would have been out of shot. By now it was getting near the end of the day and things were being packed up to go back. Due to the days shooting running behind schedule, it turned out they ran out of time and called it a wrap for the day! So after all that I wasn’t used and headed back to the locations base to have all the make-up taken off! Oh well, it happens! Rightly so the director didn’t want to rush the scene as photo’s of the victims were also needed for the crime report. Just waiting for the call back! 2 weeks later I got the call for the re-shoot, I headed back down to Cardiff to the studio’s where they had made up the interior of the bedroom of the house. This was going to be the filming of the 2 murder victims, they will then edit the main characters dialogue scenes in with the shots of the bodies. It was another lovely warm sunny day, so hanging around wasn’t much of an issue! Again I got into my costume and headed into the make up trailer, Claire the make up lady was just lovely, she really knew her stuff. I loved just sitting there and watching her work. This time she had made a slightly different latex appliance to the last one as she had a little more time to prepare. This one had thinner edges as she used the same material as a bald cap, this made the joins almost undetectable. Cotton wool was inserted into the cut to open it up more, thicker clotted blood was put in. The rest of the proceedure was the same as before, discolouring of the skin with make up. After sitting out in the sun for a while waiting, myself and my characters husband (Gary) got the call they were ready for us. We headed into the studio to find a bedroom all set up looking as it would have been in the house. On the bedside table is a picture frame with one of the photos that was taken on my first day, on the head of the bed is a larger framed photo of my character and her husband, blood spattered! We discussed with (I’m guessing) the assistant director about the scene as this was the 2nd unit crew and they were not there when the actors scene was shot. Once in position, with an ok from the assistant director the make up guys stepped in and did their stuff. Not wanting to give anything away I won’t say what was involved apart from quite a bit of blood was used! It was really wierd lying there feeling the blood soak into your clothes and run down your body and it was cold! Make up was brushed onto my feet and blood was wiped and poured onto my legs and arms. Gary was getting the same treatment on his injuries with plenty of blood being applied. Once they were happy with it all, they shot several different angles and added a police photographer in the scene taking photo’s for evidence. Then the director of the episode enters and wants us to change position so we both moved again to reshoot some more scenes . After a bit more filming, we were running into lunch so we had to break. As I got up off the bed, with the blood being glucose based, it was really sticky, I had to peel off the bed! My hair was now a nice big sticky matt, yuck! We had lunch brought to us as I guess the sight of all that blood on Gary and myself would have put people off their lunch! We went back to the set to finish off the filming after lunch, getting back on the bed was pretty nasty as it was covered in the sticky blood. Once in position more blood was applied and the last bit of filming was done. Several stills were taken for the police evidence photos and that was it. This will be the opening shot of the episode and will set the scene for the story, it will certainly get everyones attention from the start especially Captain Jacks! The series is due to air this October in the UK on the BBC, when the airing times are known I will post them up here. My make-up photos taken during my lunch break!